Went through some terrible news today. Ville Oksanen, my long time friend and colleague, passed away. He was my call-to guy for anything possible that mattered over the past 15+ years. No matter what I was calling about I could always know his feedback comes with deep insight and the highest possible integrity. Ville needs more than a quick obituary. To start with here’s something we got published in Helsingin Sanomat back in March 1999 when we were just 22-year-old nerdy students. I still consider this early piece kinda set the stage to everything that was to come in his life’s work. In other news the university awarded me as “Teacher of the Year 2010.” Pretty good for an adjunct. I took it as a sort of golden handshake for the years as I’m no longer heading courses. 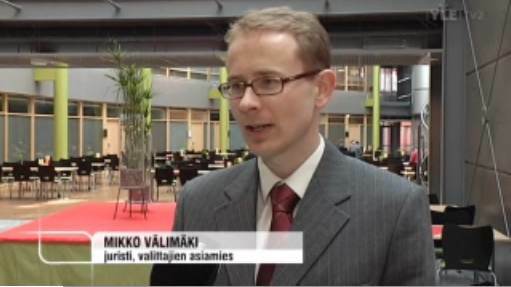 I visited Rovaniemi over the weekend for another academic seminar. James Love — who started already in the 1970s as Ralph Nader’s aide — gave an energetic keynote on global intellectual property policy. Love knew practically everything about his subject…. thus I was left just wondering why the message does not sink in. Why there is so little if any impact on policy makers. Not from academics calling for balance or user rights, granted. But not even from experienced lobbyists like Love – except for a few hacks, as he called them. He remains a critic, an underdog. Why? Perhaps the root of the problem is the ignorance of the general public. While the issues are there, they are not taken seriously because nobody knows about them. Consumer rights were there but became real only after championed by Nader. Unsafe at Any Speed. Same goes for global warming. Al Gore and Inconvenient Truth. Who would take the role of star speaker for consumer interest IP? Love offered Stallman and Lessig but I had reservations for both. A problem wih the current talks is always that the substance is broken into pieces. A separate hack here or there. You need good examples, but who would nail down the red line? The biggest legal case I have ever litigated is currently pending before the Finnish Supreme Court. It is about the administration of a Bittorrent tracker called Finreactor, pretty much like the infamous Piratebay. Our main argument in the Finreactor-case is based on the liability limitation for “hosting” as defined in Directive 2000/31/EC, article 14. I tried first in the Court of Appeal, and then again in the Supreme Court to get the justices to send the main questions to European Court of Justice for a preliminary ruling. They did not do it. Finnish courts, perhaps still reflecting the silent and somewhat shy Finnish mentality of the past times, are notorious in not sending anything there. Anyway, now it seems there are at least two trademark-related cases where European Court of Justice will say something about article 14. The first is Google v. Louis Vuitton (also known as Google AdWords case) where there is already advocate general’s opinion published. The second one is L’Oréal v. Ebay where the questions are published. 145. …Google’s display of ads stems from its relationship with the advertisers. As a consequence, AdWords is no longer a neutral information vehicle: Google has a direct interest in internet users clicking on the ads’ links (as opposed to the natural results presented by the search engine). 144. …Google’s search engine … are a product of automatic algorithms that apply objective criteria in order to generate sites likely to be of interest to the internet user. The presentation of those sites and the order in which they are ranked depends on their relevance to the keywords entered, and not on Google’s interest in or relationship with any particular site. Admittedly, Google has an interest ““ even a pecuniary interest ““ in displaying the more relevant sites to the internet user; however, it does not have an interest in bringing any specific site to the internet user’s attention. 140 …The fact remains that certain content is hosted by information society services, be it for advertising or for any other activity covered by those services. Information society services will rarely consist in activities which are exclusively technical, and will normally be associated with other activities which provide their financial support. So how I read the advocate general’s opinion — in accordance with what I have argued to the Finnish courts — is that you cannot actively participate in the publishing process in order to benefit from the liability exemption. Advocate general is probably thinking that Google is “jointly” publishing the AdWords with the users because it actively makes money from the publications (“Google’s display of ads stems from its relationship with the advertisers… Google has a direct interest in internet users clicking on the ads'”). In other words, Google has too close relationship with the publishers and is too much involved in the published content. The opinion gets however problematic when you take into account the fact that anybody can sign into the AdWords program. Anybody signed can publish any AdWords he or she likes. Google does not monitor or censor the words. And in general, everyone hosting content somewhere must have a contractual relationship with the hosting provider, pay for the use, and be able to use some publishing tools. Thus, the main rule must be that contractual relationship and collaboration between the hosting provider and publisher is possible to a large extent. The hosting provider must just stay in the provider’s role and not become the publisher. It cannot get involved in the published content, it cannot monitor the publication process, and it cannot cash-in from the publications — like advocate general is obviously trying to say. Hopefully European Court of Justice will clarify in its decision at least this part of the case. Gained exceptional court victory on Thursday: our Supreme Administrative Court found last fall’s e-voting experiment unlawful and ordered new elections. Some afterthoughts. The decision came after a vote. One judge out of five would have accepted the lower court’s opinion. A three judge panel of Helsinki Administrative Court said in January unanimously that losing 2% of votes cast was not critical and cited “state’s constitutional rights” as a legal argument to maintain flawed results. On this background, I feel disappointed the Supreme Administrative Court made a narrow legal decision, citing mainly paragraphs from the election statute and without discussing the constitutional rights basis at all. The decision’s value as a legal precedent is thus seriously limited. Why? We did argue the constitutional basis of the case in length. We cited and quoted German Constitutional Court’s and European Court of Human Rights’ decisions. We cited and quoted Council of Europe’s report, with the basis on constitutional law. No impact. Nothing. As a practicing lawyer, my own hunch is that constitutional rights remain a forbidden or worthless legal source in the Finnish courts. Any kind of more “practical” written source — be it parliamentary preparatory material, prior case or scholarly commentary — beats all constitutional law argument hands down. Our courts and judges are not prepared to assess constitutional law arguments as they require open pro & contra argumentation. These things were not teached at law school. These things cannot be learned from prior Finnish cases or tradition. I am also sceptical that our courts would change their existing practice anytime soon. At the very same date we got the winning decision, I also received the latest issue of the leading Finnish law journal Lakimies. No matter our courts do not recognize constitutional rights, there are a bunch of academics writing about them and their application in every other issue in that particular journal alone. Once more there is a 20+ page theoretical piece assessing some high-level options (mainly parliamentary and judicial) to review constitutional rights. That article, like so many others in this debate, has absolutely no connection to the Finnish courts. The article is too theoretical and thick in academic jargon for anyone who tries to actually use constitutional rights arguments before the courts. Also, it gives no guidance for a judge who must face the question: how the hell do I write a legal opinion on a constitutional right argument without losing my credibility?